Dennis! on the tour bus / Ohio "Environmental Devastation Tour," 3/9/2018. By the time you hit Cambridge, Ohio, driving south from Cleveland on interstate 77, your eyes will likely have begun to itch. Your insides will likely have been subject to a nettling discomfort, a weird, sourceless pressure. It will feel, inexplicably, as if your lungs are nauseous. Such is the density of chemicals in the Southeastern Ohio air that you'll experience these physical sensations inside your vehicle. 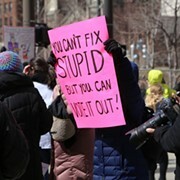 At least I did, when I joined a handful of environmental and community activists, plus Dennis and Elizabeth Kucinich, a documentarian and a college professor on an "Environmental Devastation Tour" earlier this month. Others in our tour van were likewise afflicted by the elements. 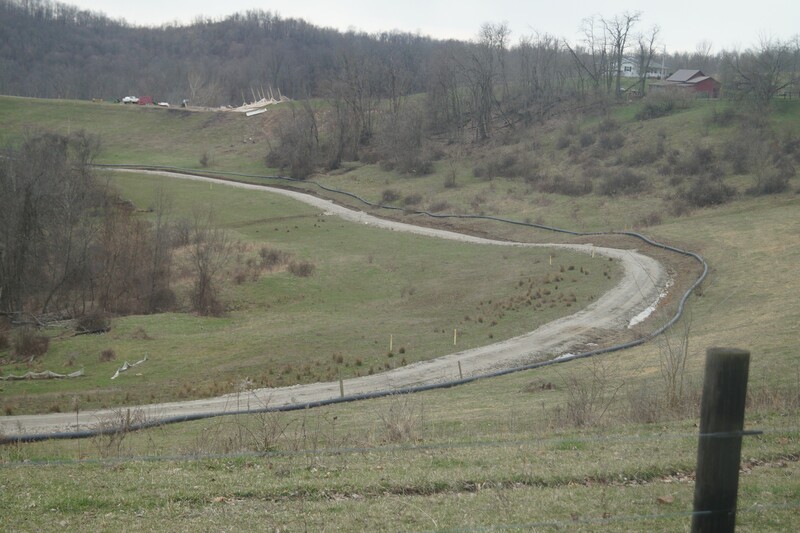 In Noble County, where fracking pads dotted the hills like lesions, Elizabeth Kucinich asked if someone might open a window. The air in the van had become not only warm, but thick. The air outside was colder, thankfully, but provided little relief. Near a country bar where we stopped for a bathroom break, I experienced a moment of horror: There was no "fresh air" to be gotten for miles, I realized, an epiphany belied by the region's forests, hills and streams in view. This sylvan quadrant of Ohio had once been among the state's most naturally beautiful areas, one of its most "precious" areas, in the words of Kucinich. But the land — the atmosphere itself — had been poisoned. "Look at the trees," Kucinich remarked more than once, pointing at the gnarled and dead branches that lined the state routes as often as not. "The trees!" Kucinich is the former Cleveland Mayor, U.S. 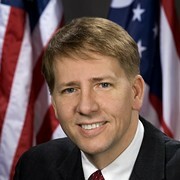 Congressman and current Democratic gubernatorial candidate for Ohio. He has made "clean air and water" a campaign pillar. Along with a full ban on assault weapons and healthcare for all, the quest for clean air and water has been as central to his agenda and his talking points as anything. But the quest is Quixotic. He has said that if elected, he would move to ban fracking, high-pressure drilling for natural gas in the shale formations deep below the earth's surface. He told the Intercept that he would block all new drilling permits and would ban injection wells too. But these bold energy proposals, these "radical" positions, may remind locals of Kucinich's tumultuous mayoral term, during which he fought local business leaders and their elected attaches over a proposed sale of the municipal lighting system to the Cleveland Electric Illuminating Company. These days, Kucinich's unwillingness to bend to corporate interests by refusing to sell Muny Light is regarded as heroic by many, even by those who are bothered or disgusted by his much more recent appearances on Fox News. 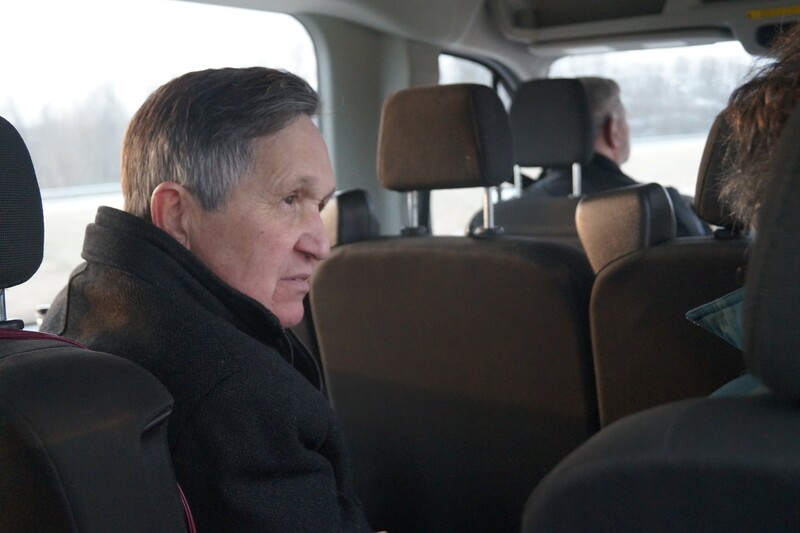 I asked Kucinich, as we traveled through the industrialized landscape of Belmont County, whether he thought Ohio voters would be on board with a protracted, costly legal battle with the oil and gas industry. Taking a stand against Cleveland's corporate class in the 70s was one thing. But oil and gas in 2018? Vegas oddsmakers would give Dennis a better shot against God. "This is something I believe in," Kucinich said. "Clean air and clean water are rights. So I'm going to fight for them. Why am I doing this — why am I seeking election — if I'm not going to fight for what I believe in?" Naive? Almost definitely. But one can't drive through these blighted, sparsely populated Ohio counties without sadness and anger and an immediate desire to escape. For the politically motivated, it'd be nearly impossible (or so I suspected) to see these counties up close and not decide that something radical should be done. 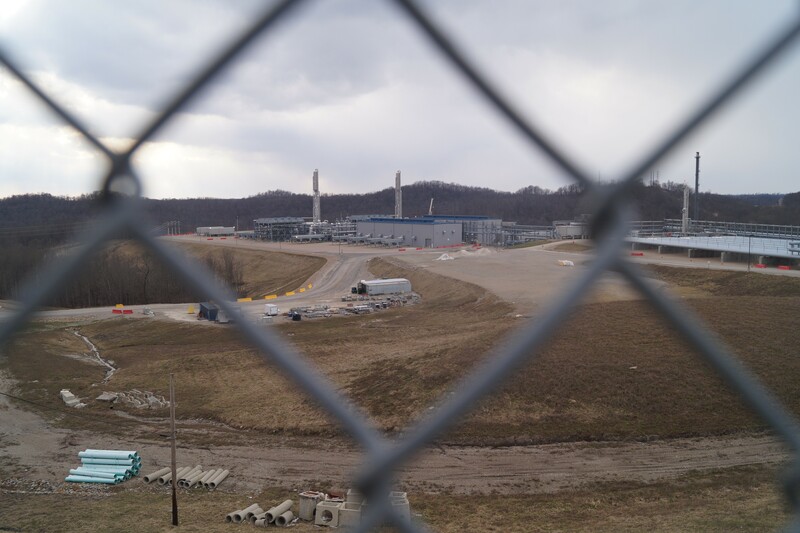 One shudders at studies like the recent one published by IHR Markit which found that Ohio petrochemical plants would be more profitable for oil and gas companies than those in the the gulf coast. (It occurs: If winning were indeed what Ohio Democrats were interested in, you'd think they would consider more fully embracing an anti-fracking position. The debatable employment benefits seem secondary to the fact that the energy companies are reviled by most of the locals, at least the ones we spoke with. These were long-term residents who have had both their private property rights and the health of their communities trampled upon. These small-town folks might resemble Trump voters in the popular imagination — they are largely white and are presumably socially conservative (I did not verify) — but they nevertheless represent a demographic that could be won over with a committed environmental campaign. The campaign needn't be about tree-hugging, (though I report in all sincerity that one of the activists on the tour did literally hug a tree when we stopped at a church, the first time I'd ever seen such a thing in person). But the campaign could, among other things, be about communities' rights to their own safety, the right to banish dangerous oil and gas infrastructure from their backyards if they so choose, (which they invariably would)). Throughout the "fact-finding mission," so dubbed by the campaign, Dennis could be seen literally finding facts, picking up tidbits of information and inserting them into his arsenal. With John Stolz, a Duquesne professor of biology and the Director of the university's Center for Environmental Research and Education, he discussed the science of fracking. He referenced "the microbio" — as in, "let's talk about the microbio," — in the way Donald Trump referred to "the cyber" on the 2016 campaign trail. Kucinich would sort of rehearse a position and let Stolz guide him through the details or elaborate on a complicated idea: the way that toxins from fracking water make their way into the air, for example. Kucinich took notes on a yellow legal pad all day long and was not above some napkin math to generate a dramatic talking point. When he heard that 11 million gallons of water are required for each fracking well and that the industry estimated it would take 7,000 wells to fully frack Belmont county, he did the multiplication. "We're talking, what, 77 billion gallons of water for this county alone?" He asked the van. At times, it was striking to watch the maturation of a candidate's political rhetoric in real-time. 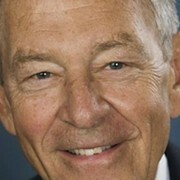 Mid-morning, Kucinich remarked quietly to Elizabeth that when he looked out the window, what he saw was corruption. Elizabeth nodded. That was good. Then that afternoon, Kucinich approached me when the group stopped for lunch at a diner in Beallsville. "All this wouldn't have been possible," he said, now polished, "without an extraordinary amount of political corruption." When one community activist announced that this area had been labeled a "sacrifice zone," by the industry, Kucinich latched on to it. He recognized the term's political power. He used it multiple times later in the day, and continues to do so in his public remarks. 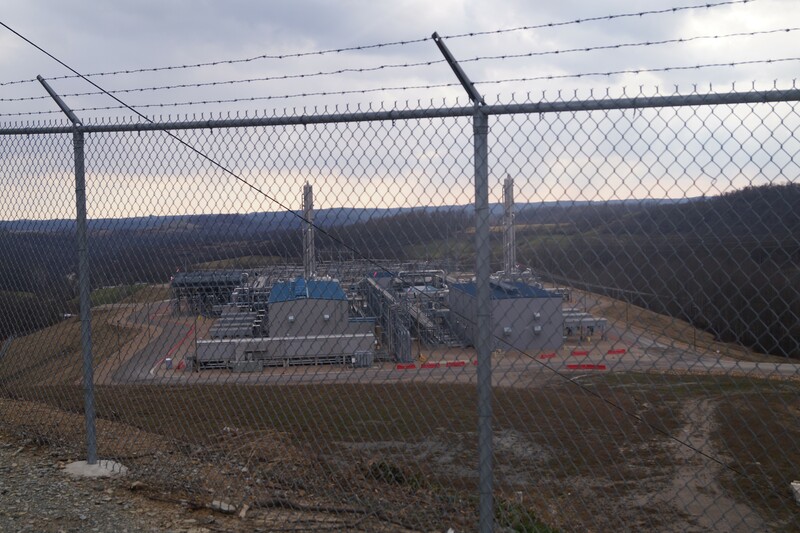 MarkWest Compressor Station / Ohio "Environmental Devastation Tour," 3/9/2018. 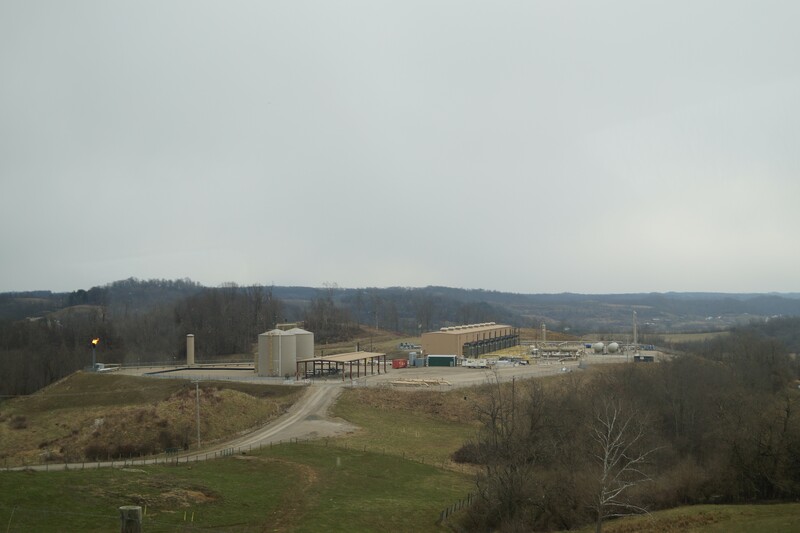 XTO Energy's Schnegg Well site / Ohio "Environmental Devastation Tour," 3/9/2018. Throughout the day, stories from residents progressed from noir to sci-fi to horror in their character. First it was the land men and the paper-pushing industry execs exploiting loopholes to build fracking pads on private land, even when individuals objected. It was the ex-military men, many of them sons and grandsons of community members, conscripted into security jobs for the energy companies, taught to treat the locals as "insurgents." Indeed, one of the more notable features of southeastern Ohio these days is the preponderance of security personnel. The whole region has the flavor of a country under military occupation. Three times when our tour van parked near an industry site to take pictures or notes, a car or truck parked immediately behind us. The observant drivers tracked our movements and spoke into walkie talkies. Then came the shocking stories, with accompanying images, of scuzzy and sometimes flammable water. There was the anecdote from a man near Cambridge who claimed he had to buy six new pairs of Carharrt boots in six months because the mud was chewing through the rubber soles. That the farm animals could no longer be persuaded to drink the water was a given — much of this land would never be farm-able again. But what of the cow that had been born with two heads? What of the two men who'd mysteriously died baling hay outside a compressor station in Noble County? The cause of death in one case, according to our local guide: a toxic liver. Then we were told of even nastier stuff. There'd been a 37-year-old woman who lived down the hill from the enormous Mark West compressor station. She'd been in good health, went the story, but died suddenly one day. After opening her up, the local doctor reportedly claimed that it looked like she'd been chugging anti-freeze. 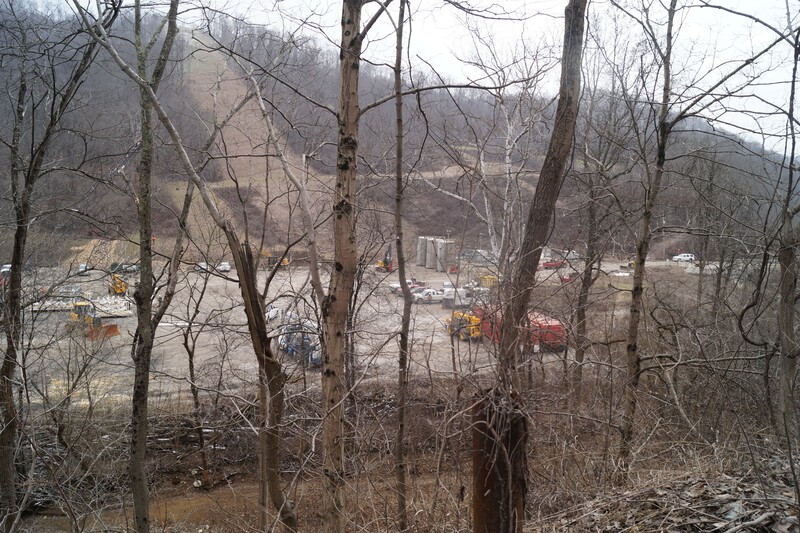 In Belmont County, we saw XTO Energy's Schnegg Well site. The well had exploded in February and remained uncapped for 19 days. The U.S. Environmental Protection Agency released a preliminary report that estimated the well leaked about 100 million cubic feet of methane per day. One local woman, on German Ridge Rd., near the well site, said that the bad things about the industry development should be looked at in context. She was sorry to lose some local families who'd sold their farms after their livestock had been halved by disease or dehydration, and she wasn't thrilled with the noise from the truck traffic. But she said she thought the traffic was part and parcel of any economic development. She also said an energy company had rehabbed a local road, and for that, she was grateful. She had experienced no personal health problems. 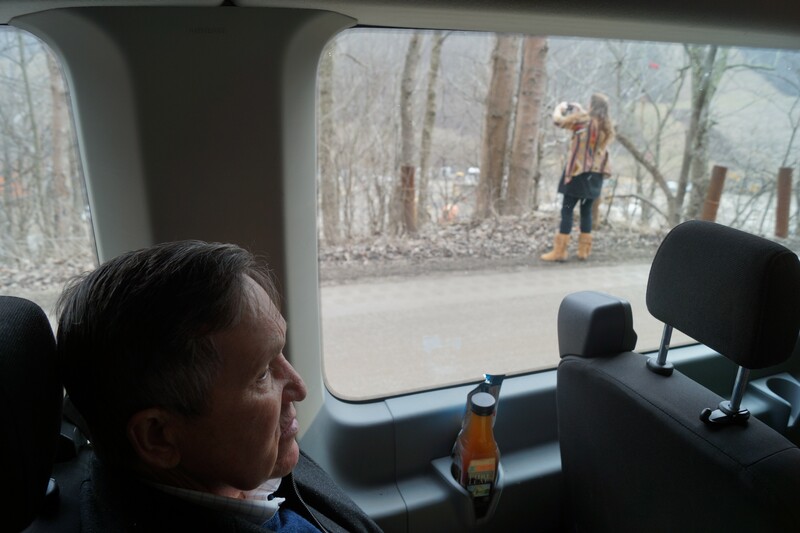 But at the Schnegg site, while Dennis Kucinich was filming one of several videos he shot with Elizabeth that day, I chatted with a local woman in the back of the van. "There are no songbirds anymore," she said. "It's just vultures and buzzards and birds that eat dead things." Then she looked out the window at the Schnegg site. She had a connection to the security company and knew about the clean-up in the explosion's immediate aftermath. She lowered her voice. "That explosion was so hot," she said, "it turned a rabbit to glass." 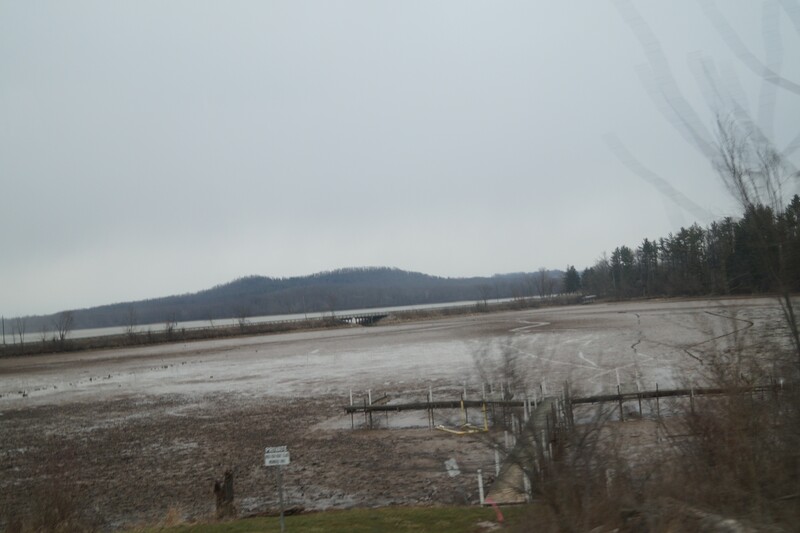 Ohio "Environmental Devastation Tour," 3/9/2018. Dennis! learns about 'the microbio' with John Stolz / Ohio "Environmental Devastation Tour," 3/9/2018.